If you're looking for a big family vehicle with excellent safety ratings, the ability to tow 5,400 pounds and reasonably good fuel economy for its size, the 2010 Chevrolet Traverse may be the best game in town. Will not recommend this model of vehicle. I love the 3-row option in the vehicle, so that I can take my entire family plus dogs. I like that the 3-row folds down so that I can cart large or lots of items, for taking stuff for kids after school or traveling with family. The engine has had several issues and has costs lots of money. The transmission was replaced. Now the engine light will not go off, nor with the air light. Nothing wrong with tires. Husband and brother will have to remove most of the items under the hood in order to fix the engine light. The mechanics got it to go off for 3k miles, but it came back on. So this time, family will attempt. Once fixed, will attempt to trade in for another American made car. Better than I thought it'd be! I like my Traverse. I did have a few problems in the beginning with the traction but eventually it worked itself out because I have never had a problem since. I like the radio controls on the steering wheel. Volume goes up on its own when you speed up and goes down when you slow down. It is a very reliable SUV, drives great in nasty weather. Separate heat and cool controls for driver, passenger and back rows. Very spacious. Back row folds down. Second row seats fold up behind front seats as well. Hatch door can be remote operated. Gas gauge tells how many miles you've gone and how many miles you have until you run out of gas. Tire pressure gauge that tells air in each tire. My Traverse gets great gas mileage. 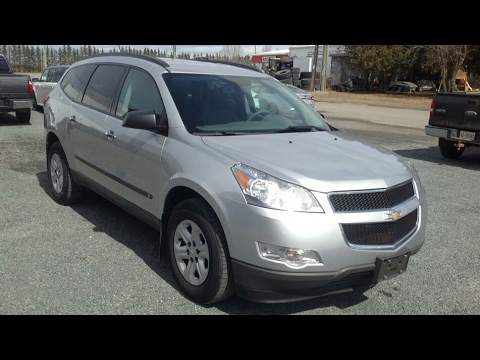 I have owned my 2010 Chevrolet Traverse for two years. I have had a few minor problems with my Traverse; the most expensive was having to replace the ac unit. On occasion my radio does not want to shut off; this is after I have turned my vehicle off, pulled my key out and opened the driver door. All in all the Traverse has been a reliable vehicle for myself and family. One of the many features that is nice having is having third row seating, this is wonderful especially when traveling and the occasional need for extra seating. There is a DVD player in the back, kids definitely love this feature. Overall, I am happy with my Traverse. General Motors LLC (GM) is recalling certain model year 2008-2012 Buick Enclave vehicles manufactured January 3, 2007, to February 29, 2012, 2009-2012 Chevrolet Traverse vehicles manufactured July 6, 2008, to February 29, 2012, 2007-2012 GMC Acadia vehicles manufactured September 15, 2006, to February 29, 2012, and 2007-2010 Saturn Outlook vehicles manufactured August 17, 2006, to March 18, 2010. The affected vehicles, equipped with the power liftgate option, have gas struts that hold the power liftgate up when open. These struts may prematurely wear and the open liftgate may suddenly fall. GM will notify owners, and dealers will update the software for the power liftgate actuator motor control unit so that the motor will prevent the rapid closing of the lift gate, free of charge. Owners were mailed interim notices on August 3, 2015. Owners will receive a second notice when remedy parts become available. Owners may contact Buick customer service at 1-800-521-7300, Chevrolet customer service at 1-800-222-1020, GMC customer service at 1-800-462-8782, and Saturn customer service at 1-800-553-6000. GM's number for this recall is 15240.